Want to track your new SBI ATM Debit card online? Yes you can track your card delivery status. For your information, now you can request new SBI ATM Debit card online through net banking and SBI YONO. No need to visit bank to apply new debit card. You can select different debit card according your need and order online. If you want to upgrade your card or want new debit card, simply block your current card and place new card request online. Debit card will be delivered at your address within 15 days. See how you can track your new SBI Debit card online after order it online. After request new debit card, after few days you will receive courier details via SMS. 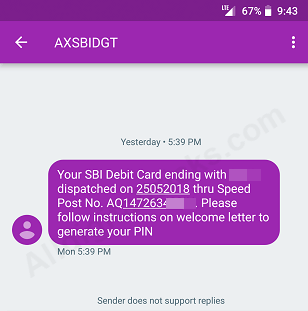 Normally SBI dispatch your card through Speed Post. You will receive Courier details SMS on your registered mobile number. In this SMS you can see tracking number as you can see below screenshot. In below image you can see courier partner is Speed Post. 2: Enter consignment number mentioned in SMS and enter captcha code. Now click on submit. 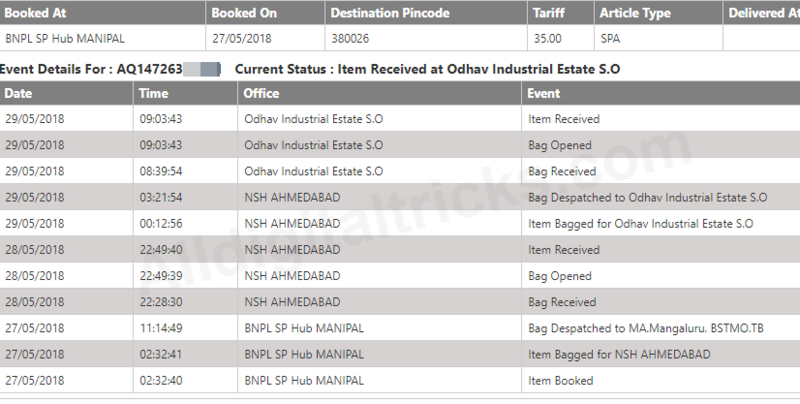 3: Next screen you can see your Debit card delivery current status (Current location) as you can see below image my debit card reached my nearest hub and it will be delivered today. Once card delivered, you can activate your card online and also generate card PIN online, no need to visit bank. Hope you also able to track your new SBI ATM Debit card status online by following this process. If your courier partner is different, then visit its website and track your order details by entering tracking number send on your registered mobile number. I have not received any SMS regarding the dispatch of the new ATM card .how can i track the status of the debit card? my atm debit card not recived yet. Sbi Debit card will be delivered within 15 days. You will receive SMS with tracking details when your card will be despatched.